Mt Patuki is the apex of the Lake Turner, Donne and Tutoko catchments. 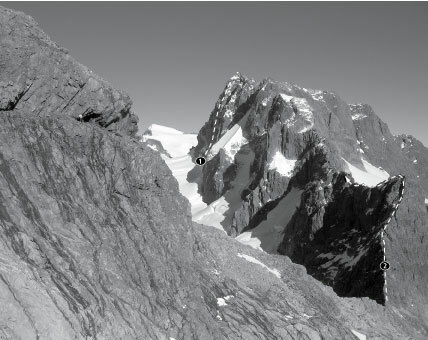 Below the first knob on Patuki’s East Ridge is an attractive looking arete of red rock. Scramble up from the left to belay. Climb rightwards into a short corner at the base of the arete. Up this and on to the arete proper. Puff your way over the nose. Ian Cave, Mike Gill, Dave Nichols, 1962. The party accessed the route via the Taoka Icefall, and descended the couloir on the North East Face to make the first traverse. The first ascent party accessed the ridge from the Taoka Icefall. Lloyd Warburton, Gerry Hall-Jones, Dec 1955.